Someone suffers a stroke every 45 seconds, which translates to more than 780,000 strokes in the United States annually, according to the Centers for Disease Control and Prevention. Strokes are the third-leading cause of death in the United States, after heart disease and cancer. A stroke occurs when a clot blocks blood to the brain, causing brain cells to die, often resulting in impaired speech and movement, among other issues. To expedite treatment, South Florida’s firefighters, doctors and local hospitals have collaborated to create one of the largest stroke consortiums in the nation. 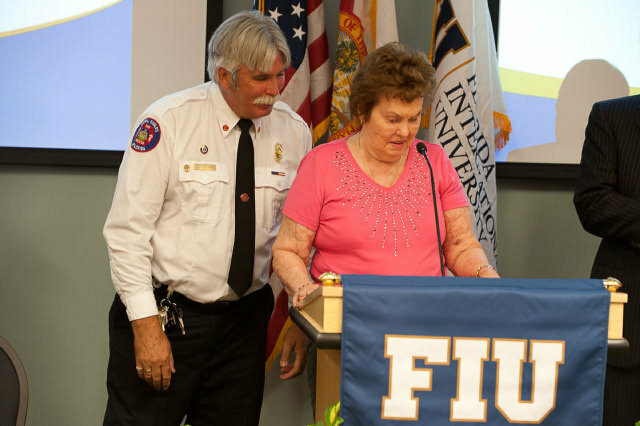 Called FOAM-D Stroke Consortium, it will comprise seven fire departments across Miami-Dade, 16 local hospitals and doctors from Florida International University’s Herbert Wertheim College of Medicine. The consortium should result in a more rapid response in treating stroke victims. There are four hospitals in Miami-Dade that have comprehensive stroke centers: Aventura, Baptist, Jackson and Mount Sinai, along with three in Broward: Broward Health North, Holy Cross and Memorial Regional. The vision to create a stroke network began in 1999, when only about half of the hospitals in South Florida were performing CT scans on a 24-7 basis. The scans are necessary to administer the clot-dissolving drug TPA (tissue plasminogen activator). Dr. Alejandro Forteza, director of the Cardiovascular and Stroke Institute for Jackson Health System and a neurology professor at FIU, and Dr. Jeffrey Horstmyer, founding chairman of the department of neurology at FIU, started a nonprofit with local fire departments called the Miami-Dade Stroke Coalition. The coalition worked with emergency room doctors, fire departments and hospitals so every hospital in the coalition could conduct scans on a 24/7 basis and therefore administer the clot-dissolving drug. The physicians then instituted comprehensive stroke care, which is given to patients who have suffered a stroke to the brain, or have been suffering for more than 3 1/2 hours. In these cases, a patient has to see an interventional neuroradiologist, who removes the clot by inserting a catheter that can suction it out. Forteza and Horstmyer, working with the EMS committee headed by Capt. John Curry, also designed a two-page checklist called the Stroke Alert, based off a prototype from Lake County. Firefighters say this new checklist helps expedite transporting stroke victims to the right treatment center. The consortium also will collect data from the hospitals to determine whether current practices are effective. Lastly, Forteza said Phase 2 will include educating the public about the symptoms of a stroke. “One program will be teaching school children about the symptoms of strokes and having them teach their parents as homework,” Forteza said.